We all love Ice Cream and so did Alexander the Great (356–323 BC) who sent his slaves into the Apennines Mountains for snow and ice to concoct the luscious iced fruit nectar he craved. Ice cream industry in most countries is highly competitive due to its market potential. In the battle ground are the two industry giants – Nestle and Unilever and several other national brands. In India we are familiar with Amul, Kwality, Vadilal and others. Companies are continually churning out new products. Strategic moves like buyout, tie-ups with food chains like McDonald are often taking place. Commenting on Russia’s ice cream industry Winston Churchill once put it: “You cannot defeat a nation that enjoys ice cream at minus-40 Celsius.” Well that’s what ice cream can do! The company sells the ice cream to franchisees and national accounts. A regular feature in good old days Ice cream Ice cream made by hand in a large bowl placed inside a tub filled with ice and salt was a regular feature in most families. Dippin’ Dots is the marriage between old fashioned handmade ice cream and space – age technology. The case as such talks of the founder’s innovative product and the spirit of an entrepreneur. Not much is mentioned about the company’s strategy. A summary of points that were came up in our class discussion is given below. (a) Entrepreneurial zeal: Other scientists thought Curt’s idea was crazy to think he could do this because nothing like that had ever been done before. He worked 80 hours a week for months trying to perfect his method. He established as a company and production begins in a crude manufacturing unit in Curt Jones’ parents’ garage in Grand Chain, Illinois. (b) Curt had to manage funding by sourcing loans. His parents helped d by mortgaging their properties. This paid for patenting his idea and protecting him from competitors. (c) Initially a focused strategy that gained market recognition with a single innovative product. This helped him develop core competencies early. Today they have 12 flavors and more than 400 franchise in US alone. Overseas expansion in about 10 countries is managed through a Global division. An average growth rate of 15 percent was maintained. (d) Word of mouth marketing proved successful because the product was innovative. Many prospective franchisees wanted to establish. The franchise route was the only way to get funds for growth and establish a brand identity. (e) It was decided the ‘youth’ between 8 –to 18 year olds, will be the target market segment. 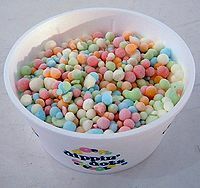 Also segment was stretched to include the generation of parents who grew up on Dippin’ Dots. Social media technique was leveraged effectively. A company web page in ‘Facebook’ in 2007 became a big hit with 1000s youth signing up every day. Ads were put is Seventeen and Nickelodeon magazines. Franchisees were made to pay half percent of their gross incomes to an advertising fund. (f) Another demand driver is the growth of malls and multiplexes across the country proved a boon – provide access good locations and tap the ready consumers. (a) Dippin’ Dots must be stored in subzero temperatures to maintain the dot consistency. Special equipment and freezers for storage and transportation is serious constraint for rapid expansion especially in emerging economies. Cold chain logistics is central to the ice cream business but the irony is that it is not Dippin’ Dot core competency. (b) In India alone, the organized ice cream industry has a turnover of around Rs. 1000 Cr. and the market is witnessing a booming growth rate of 12-15% annually. Baskin Robbins a leading brand in India is the world’s largest chain of exclusive ice cream stores with over 5,600 retail shops around the globe. Whereas Dippin’ Dots expansion at best has been modest due to the constraints. (c) No significant diversification moves are seen. A new line in packaged ice-cream could be considered. This will help spread brand message and strengthen recognition and brand recall. (d) The company has grown in size and needs to move out of its entrepreneurial culture. The company needs to energize its vision and build organizational capabilities. A coherent a global strategy must be developed to guide further growth. As its patent has expired competition will become more intense. 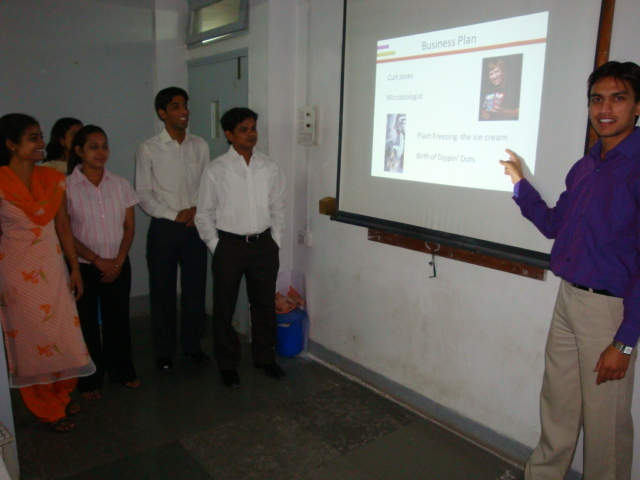 Posted by dilipnaidu on March 18, 2010 in Case Studies, My friends - photos! and tagged Alexander the great, Dippin' Dot, Ice cream brands, Strategy, Wiston Churchill. I am delighted that you find some of the management posts useful and I wish you all the very best. Warm welcome. I am thrilled to read your comments all the way from Philippine. And I am glad you like the post on Dippin Dot. Great to know you a former Chef wow! Innovative ideas in businesses like ice-creams and in markets like US can really work wonders for anyone – Dippin Dots seems to be one such case…Supply chain management is another important aspect when it comes to managing ice-cream business effectively..
Dippin dot did have a succees story to it…thank you all for the insight to the case. i would also like to add a point of creating an awareness of the brand (Dippin dot).i believe the company should try to reach out to the audience and make there product more visible may though advertising campaigns or commercials..
Hi Zeenat, thank you for your comments. I agree brand awareness seems low. I was chatting with friends in the US and to my surprise they did not about Dippin Dots. They have been in the US for more than 8 years. Dippin Dot`s,without a doubt is ice-cream of future. No-one thought except Curt that we can make ice-cream in tiny beeds(dots).This was one of the POD(point of difference)company had.I think this was USP for them. Flash freezing technique which they introduced was unique.The rigorous work which curt did for 80 hrs week reflects his strong desire to achieve success. How nice to have you come up with a lovely response. I am glad you have touched upon Dippin’ Dots need to strengthen their expansion driven by a franchise model I had missed this point – thanks. More flavors -Yes but serving the colored Dots in sub zero temperatures is exciting and differentiates it from all others. So diversification in packaged icecream perhaps may be a more feasible option. Dippin’ Dots is revolutionizing the way we think of ice cream. A high-tech freezing process is a highly advanced method of ice cream production, unique within the ice cream industry. I think they need to work hard on their franchise model and have to go for an extensive expansion mode. New product development method to avoid a high freezing temperature and more flavors should be introduced. i really liked the idea of flash freezing for ice cream it is unique. I totally agree with it. The uniqueness, Dippin’ Dots has is an advantage over other ice creams but this itself has developed into a hurdle for there further expansion. The company should try to develop products which can overcome this hurdle and use the brand equity created by its unique product. They are trying to introduce one product called Cream and Dots which is trying to break the barrier and put there ice-cream on the grocery shelves.But thats only one product. They should do it more aggressively and diversify into more segments of the ice cream industry.This would definitely help the company to be more competitive as other companies are catching over on their mother product, since the process patent has expired. You and your group did a great presentation on Dippin Dots. What a coincidence that you are PG in microbiology and your part especially the video demonstrating the cryogenics process was masterful. The input on ‘Cream n Dots’ is super. Just what they need for entering newer market segments. The growth will need to be powered with newer strategies and more professionalism. The situation becomes more critical since the product patent has expired the competition will become fierce. I appreciated your comments and also your active class participation.